As far as lost albums go, Apocalypso may not exactly be Smile, but it ain’t no Chinese Democracy, either. 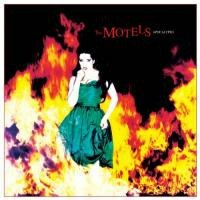 The story behind what was to be the third album from the ‘80s Los Angeles New Wave band, the Motels, reminds me a bit of a fairy tale. One that goes something like this: imagine it’s sometime in late 1981 and the Motels have convened in an office at a record company headquarters where the band is ready to present their latest creation, an album that they called Apocalypso, to three record label executives. However, instead of being your typical A and R guys, the three suits are three identical versions of Goldilocks from that old yarn about the three bears. Particularly proud of the record was new guitarist Tim McGovern, who was then dating the lead singer of the group, Martha Davis, and who fought producer Val Garay all the way to ensure that his particular vision for the record, which he had a large hand in shaping, prevailed. The band threw the record on, and sat back as the three female executives in power suits leaned back in their chairs to listen. However, it didn’t take long for frowns to appear on the brows of the three little girls. “Hmmm, this record seems a little too dark,” said the first Goldilocks. “Yeah, this record seems just a bit too strange and weird,” said the second. “And I’m not hearing a hit single,” said the third. At this point, the band decided to hold a meeting outside of the office to mull over this offer. When they returned to the room, sans McGovern, the band told the gathered executives that they would shelve Apocalypso, and send it deep into the bowels of the vault at the record company, Capitol Records, never to hear or speak of it again. What the band promised in return would be a new record, one that might feature some reworked and retooled versions of the songs the executives didn’t like, and one that wouldn’t be so foreboding and menacing. “Hey, didn’t there used to be more of you?” suddenly asked one of the executives. "Yeah,” sighed Davis. “I was dating the guitarist, but it wasn’t really a great relationship. Plus, since he did a great deal of work and some songwriting on that record you didn’t like, I just threw him out of my life and out of the band.” At this, the Goldilocks rubbed their individual hands with glee. That pesky guitarist was, at least in part, responsible for the debacle they’d just heard, so maybe the group would go on to make shiny and polished radio-friendly hits without him. And so it went. Of course, there were no Goldilocks (as far I know, the suits at Capitol Records were men), but that’s pretty much the story behind the lost and forgotten third record from the Motels. As anyone who grew up in the early 1980s can tell you, the band would go on to be two-hit wonders, scoring Top 10 hits with a reworked version of “Only the Lonely” that was to originally appear in a much less varnished form on Apocalypso and another song called “Suddenly Last Summer” during the years immediately following 1981. After a cancer scare for Davis, the band pretty much dropped out of sight by the mid-‘80s, though they have since reunited. Still, Apocalypso had been forgotten about until this year, the 30th anniversary of the recording. To mark that milestone, L.A.-based archival recording label Omnivore dug deep into the vaults and pulled out and released Apocalypso in its original format, throwing in a clutch of demos and outtakes from the era for good measure on all digital copies of the disc. (All in all, 11 of the 17 songs included on the recording have never surfaced until now, including a karaoke version of “Only the Lonely” with the vocals wiped out, an unlisted bonus track.) The album was released almost exactly to the day 30 years ago when the recording sessions originally wrapped up. As one commenter on Amazon has noted, Apocalypso is just like getting a whole brand spanking new album from the Motels during their prime. The thing with Apocalypso – its title cleverly combining the words “apocalypse” and “calypso” – is that it is hardly the train wreck that the label head honchos made it out to be. Sure, there isn’t a bona fide single on the record, but it might just be the most sonically consistent album the band put out. I used to own on vinyl what became the follow-up album released instead of Apocalypso, 1982’s All Four One, as well as 1983’s Little Robbers. I no longer own those records, probably because they sound dated and are full of fluffy filler once you get beyond the main singles. Apocalypso certainly has its flaws and isn’t quite interconnected and solid as a whole, but there’s a permeating feeling of exploring southern California sleaze on this record – something that seemingly was really only being exploited by glam metal acts of the day, such as Mötley Crüe. Apocalypso dances on the brink, exploring the decay of the music scene and general SoCal culture. Of course, the main attraction here is the original take on “Only the Lonely”, which reveals the song to be not as aerodynamically slick and plastic as the version that would go on to be a big hit for the group. The basic DNA of the track remains intact, but this version of “Only the Lonely” isn’t quite as mesmerizing – it seems plain and undressed somehow. Instead of guitars and sleek keyboards, Davis opens the song by singing against a stark and naked piano line. Not yet cemented into the song is the blistering guitar solo, though the nimble sax solo remains an integral part of it. The formula is down, but it just doesn’t have that je ne sais quoi that eventually made the song a relatively monster hit. In some ways, the song seems like a demo – so maybe it’s one place in history where record executives had their finger on the pulse of potential accurately. Here, “Only the Lonely” is a shadow of the radio- and MTV-friendly song it would eventually transform into. As far as the obscurities go that are attached to the album, they’re either interesting or unnecessary. The alternate version of “Art Fails” doesn’t fall too far from the album version, and it sounds as though it had been sourced from a scratchy vinyl record. The demo take of “Only the Lonely” is, well, a demo of what would be essentially a demo, though the piano has been replaced with soaring synths that would mark the way forward for the song commercially. Despite these needless ruffles, there’s some appealing material to be had here. The four-track demo of “Don’t You Remember”, which lasts more than six minutes, is a kitchen sink clang of neo-soul. “Fiasco” sounds very Beatles-esque, landing with pinpoint accuracy on Sgt. Pepper’s Lonely Hearts Club Band. “Obvioso” is a country-ish, cow punk number, something that the band never further explored as a sound. As far as lost albums go, Apocalypso may not exactly be Smile, but it ain’t no Chinese Democracy, either. It is, in short, an assured and listenable collection of melancholic and melodramatic New Wave – and the Motels would never really sound this way ever again, angling in for a more sculptured sound that was a bit more upbeat, or as upbeat as you could get with such odes to longing as “Only the Lonely” and “Suddenly Last Summer”. At least, Apocalypso is dead serious in intent, and doesn’t possess the cloying silliness that would mark subsequent releases. (“Monday Shut Down”, I’m thinking of you.) The second half of the album isn’t as compelling as Side One, simply because it’s a bit lighter in feel, but overall it is an assured collection of songs that aren’t half bad – and it makes the case that Apocalypso is the Motels’ strongest effort in their early ‘80s catalogue. The Motels were a disposable pop band, but with Apocalypso they did something different. Tthey created somewhat memorable, somewhat damaged art. Hadn’t it been for a few record executives behaving like Goldilocks, we might remember the Motels in an entirely different light. Maybe not quite as forgotten, maybe not quite as lost.